The desk, ready with the infantry, heavy weapons and trucks! I decided that I would start to finish my World War 2 Jaanese. This way I’ll have a local opponent for my early World War 2 Russians. 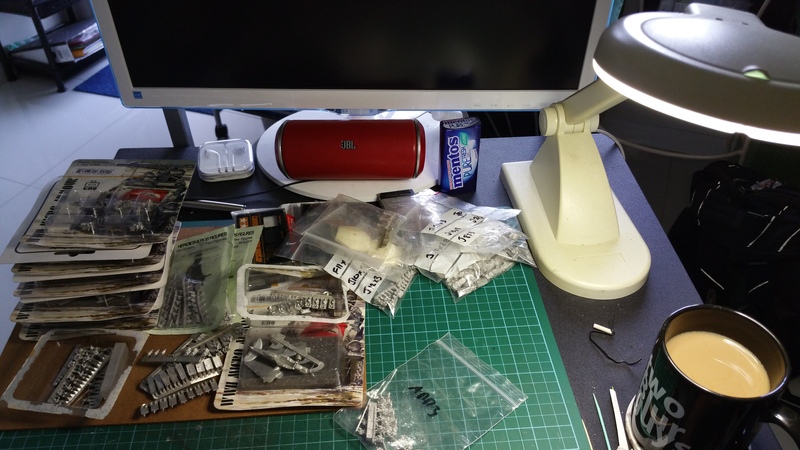 As the armour is mostly done, and the aircraft half painted, it is time to put together the infantry and artillery. Where the Russians are based around 9 bases to the company/battalion, whatever the level is I am playing at, the Japanese will have 12 bases. Added to that then the heavy weapons support, artillery from the 75mm Field Gun as well as the 70mm and 105mm howitzers, some 20mm anti-aircraft guns and trucks, loads of trucks, 43 of them, then this force will be ready. I also have some fun stuff to add to the army but more on that later. First off it will be the infantry heavy weapons and artillery. I’ll worry about the trucks and the pack animals later. Oh, one largely anachronistic item for this army is the beautiful Mistsubishi G4M3 “Betty”. It did not fly over Manchuria/Mongolia but it is a great little aircraft never-the-less. Good to see you back in the saddle Ian.